How to Stay Employable and Ace Your Interviews? Most often than not, we tend to neglect our scalp’s health unless we face problems like hair loss or dandruff. Hence I’m honoured to be invited by Sample Store & Beijing 101 to try their 4-Step Signature Meridian Hair Treatment because I tend to neglect to care for my hair and scalp. I personally do have a greasy scalp and flat hair comes as a result because of the grim. Moreover, I inherited my grey hair problems from my mom and I’ve been dyeing my hair since the age of 17 due to this reason 🙁 My scalp tends to get irritated and inflamed as a result of my frequent colour treatments at salons. Rebecca scanned my scalp to reveal a gross mess happening on my scalp. It looked oily, flaky, and angry red! I was told that if I leave my scalp unattended and continue with my harsh chemical dyes, my hair follicles would be more clogged and my hair would not be able to absorb ample nutrients and hair loss + grey hair would be the ultimate outcome. So it was recommended for me to go for the treatment that helps to support sleeping disorders. After a detailed consultation with Rebecca, I was led to an exclusive treatment room that felt like a spa heaven! Rebecca applied some herbal hair mask directly onto my scalp. Unlike most herbal hair masks, this one doesn’t have the herby stench that I dread – in fact, it smelt floral as it was infused with Lavender Essential Oil and Lavender is great for calming and relaxation. My inflamed scalp felt soothed when the mask was being applied. I enjoyed the scalp massage whilst Rebecca was shampooing my hair and she helped to dry my hair before giving me a hot herbal sea salt compress on my shoulders. It felt so warm and comforting, especially after a hair wash! Whilst the hot herbal sea salt compress was on my shoulders, Rebecca applied some hair tonic to help my scalp detox and she gave me a lovely acupressure scalp massage that felt so relaxing! 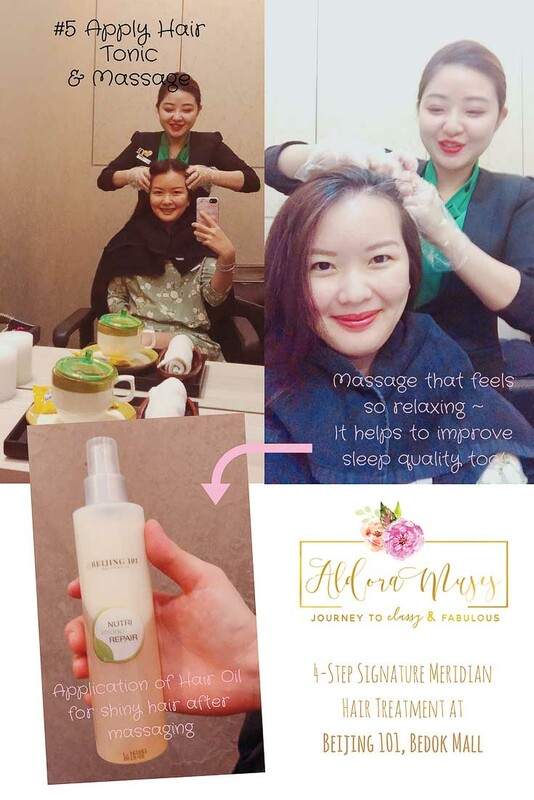 After the relaxing massage, Rebecca proceeded to apply the Beijing 101’s Nutri Hydro Repair hair oil to the ends of my hair and proceeded to style my hair with the hairdryer as a finishing touch. 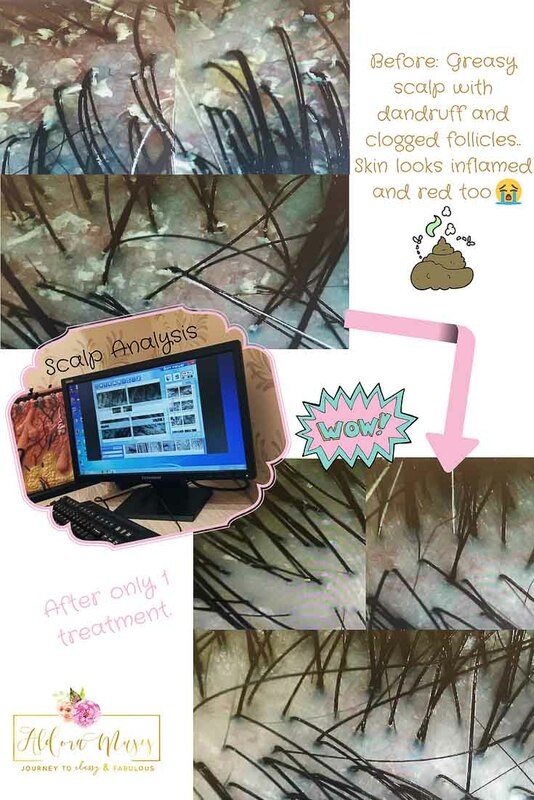 My scalp felt so refreshed immediately after the treatment but I went ahead to do a scalp analysis just to check the final results anyway. Are you excited to view the results after my first treatment? 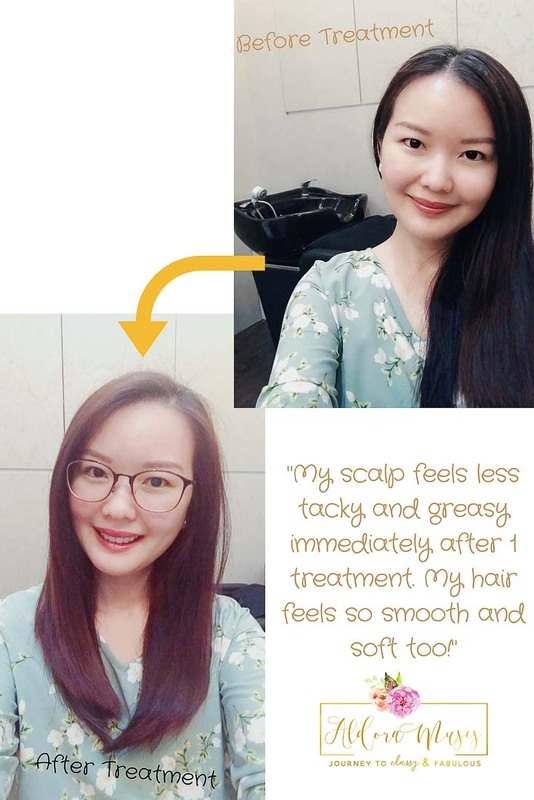 The difference is SIGNIFICANT and I’m super impressed with the results because I’ve tried scalp treatments with other salons many years back and the results ain’t drastic as THIS! That said, a one-off treatment will not be a permanent cure for our hair & scalp woes – it is still recommended that we do our regular maintenance by going for such treatments once a month. Wanna experience it for yourself? 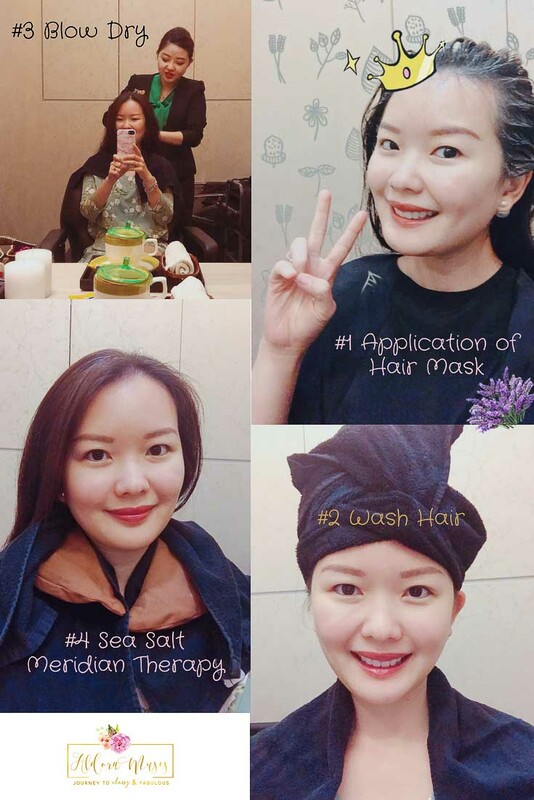 Besides treating hair loss problems, Beijing 101 also provides a vast range of hair services, such as treatments for premature greying of hair, dandruff, oily scalp, haircut and even herbal hair dyes. 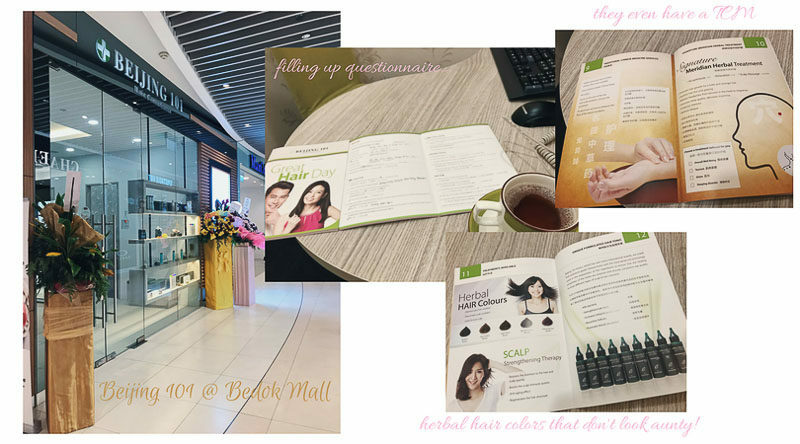 The consultants are professionally trained to assist you in your hair needs, unlike other salons I’ve previously visited where I experienced pushy sales and empty promises. 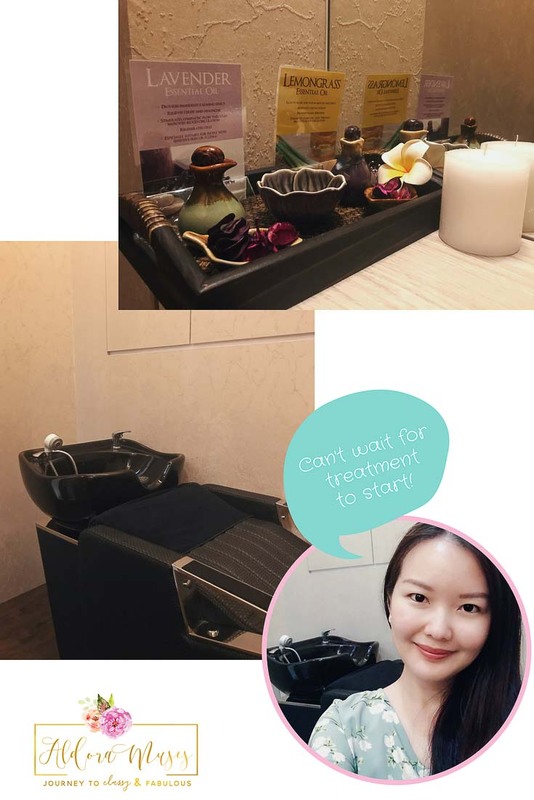 If you would like to experience Beijing 101’s treatment for yourself, the current promotion they are offering is a FREE Hair Care Pack worth $136 with purchase of 3-Step Deep Cleansing Scalp Care Treatment @ $40 nett (U.P $424). 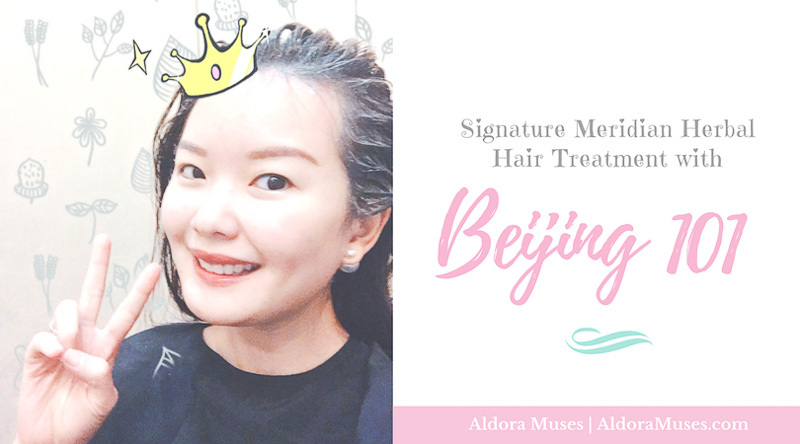 Please visit http://beijing101hair.com/SampleStore_Aldora_PromotionMay18/ to book your appointment now! *Disclaimer: Exclusively for new customers with hair problems only. Free gifts and treatment special offer are redeemable after consultation and for one redemption per customer only. Other terms and conditions apply. All persons under 18 years of age must seek parental consent before proceeding. Individual results may vary. Howdy people! I am a candid Singaporean Beauty, Fashion & Lifestyle blogger with a fetish for everything beautiful. 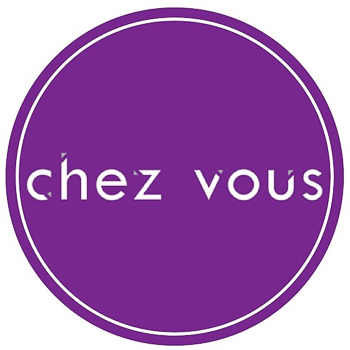 Join me in my journey to be classy & fabulous!